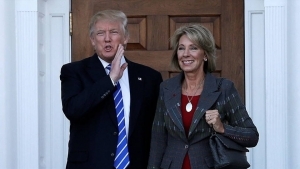 Despite a clear alliance between some of the U.S.’ largest charter networks and President Trump cohorts such as U.S. Education Secretary Betsy DeVos, independent charter companies are looking to separate themselves from the fray, Chalkbeat reports. This week, the site covered a fascinating New York symposium that reportedly touched on, among other things, a divide in the nation’s growing charter movement between major networks and small, “mom-and-pop” charter operators. Stand-alone charter schools say they’re often overlooked in favor of big-name networks like KIPP — while at the same time being unfairly tied to Betsy DeVos’s agenda. At a symposium last week, a number of school leaders agreed to try to change that by launching a new national organization dedicated to independent, or “mom-and-pop,” charters. “When people think of charters, they do not think of us,” said Steve Zimmerman, an organizer of the conference and founder of two independent charter schools. In a hotel conference room in Queens, leaders from nearly 200 schools across 20 states unanimously called for the group’s creation. They also adopted a progressive manifesto that tried to separate the members from the Trump administration and common criticisms of the charter schools. It marks yet another fissure in the nation’s charter school movement, which has seen political and philosophical divides open up in the wake of U.S. Education Secretary Betsy DeVos’s appointment. And while the loose group of independent charters does not yet have a name or a clear funding plan, its leaders believe they can provide a louder, more democratic voice for their concerns than existing charter advocacy groups, which they say are too focused on expanding networks. National Alliance spokeswoman Vanessa Descalzi said the group supports independent charters. Zimmerman is the co-director of the Coalition of Community Charter Schools, an organization for independent charters based in New York City that co-sponsored last week’s conference. That symposium, he said, came out of a desire to shift the discussion around measuring schools away from just test scores. He declined to offer specifics. But Eva Moskowitz, the head of the Success Academy network in New York, met with Trump soon after he was elected, and the National Alliance initially praised a Trump budget proposal featuring deep cuts to education spending but an increase for charter schools. Both have since distanced themselves further from the administration. “To have in any way the charter world associated with that felt that it was really going to hurt our message,” Zimmerman said. Charter networks nationally and in North Carolina have embraced privatization in some cases. As Policy Watch has reported, school choice advocates connected to networks like TeamCFA, which operates 13 schools in North Carolina, led the push for state lawmakers to approve a controversial charter takeover of low-performing schools last year, a program that may open the door to private control of traditional public facilities. This week’s Chalkbeat report goes on to explain the details of a “manifesto” authored by symposium leaders, which took on frequent criticisms of school choice backers. Charters should be “laboratories of innovation” that seek to collaborate with districts, it says. Charter schools should serve “students who reflect our communities and neighborhoods, particularly students with the greatest educational needs,” and their leaders should create workplaces that are “collaborative, not adversarial” for teachers. And while the group calls for schools to be held accountable for results, the mission statement says “real accountability must be rooted in the development of the whole child and the needs of society.” That’s a different emphasis from advocates who promote charter schools because they are more effective, as measured by test score gains. In some ways that philosophy is more aligned with that of more conservative charter school supporters, including DeVos, who have argued for more innovation and less emphasis on test results. But Zimmerman distanced the group from a free-market approach. He is strongly opposed to private school vouchers, though said that’s not a stance the new organization has codified in its manifesto. There is evidence that nonprofit charter networks do a slightly better job, on average, boosting test scores than independent charter schools. Those findings may explain, in part, why independent charter school leaders bristle at focusing on those metrics.